Let’s be honest, one of the best things about being on holiday is eating out and not having to cook or do dishes! We often get asked where the best places to eat and drink in Rotorua, so we thought we’d put together a list of our top local faves that are affordable and delicious! We are super lucky to have an abundance of places to eat and drink here in Rotorua and we guarantee there will be something to suit all tastes. Make sure you’ve got an appetite because this food is not for the faint hearted! Locally owned and operated these guys make the best burgers and a range of other mouth-watering goodies. The Buttermilk Chicken burger is a stand out favourite because the only thing better than fried chicken is fried chicken in a burger. The slow cooked Pork Belly bites and Guilty Loaded chips also deserve a special mention! Enjoy the relaxed atmosphere and dine in or grab your food to takeaway. There are also plenty of gluten free options for our coeliac friends and a kid’s menu with the best witty menu names! You also need to check out their secret menu! If you’re looking for Japanese cuisine look no further than Yamato. This place serves up authentic Japanese cuisine with the best sushi in town! If you’re a seafood lover their sashimi is super fresh and delicious! A popular spot for locals and tourists alike it is recommended to ring and book a table in advance or if you’re lucky you can grab a seat on the bench and watch the chef prepare your order before your eyes. There are plenty of options for our vegetarian friends as well! Did someone say Avocado sushi roll?! 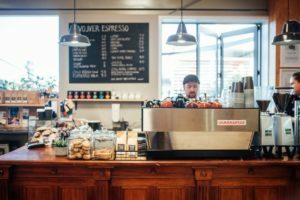 Tucked in the middle of town and a welcome addition to the Rotorua café scene is Scope Rotorua. Grab something from their extensive range of ready to eat cabinet food or order off their menu. 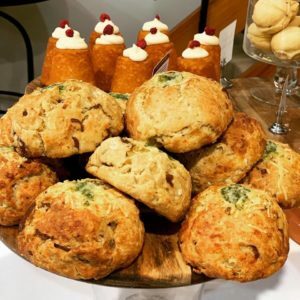 Keep an eye out on their social media for their scone flavour of the day but get in quick as they sell out most days! Or if you’re in the mood for something sweet, their Salted Caramel Hummingbird cake is all kinds of yum! Open at 7am for breakfast and lunch, these guys can also out cater with all of their food being prepped in house. If you’re lucky enough to be in Rotorua on a Thursday evening, you need to visit the Rotorua Night Market. Popular with locals and visitors alike, the Rotorua Night Market is a family friendly event that is available all year round where two sections of the road on Tutanekai Street are closed off to vehicles and transformed into a mecca of food and live music. Grab a bite from the extensive range of ethnic cuisine and relax on the tables or beanbags around the street while being entertained by local musicians. There are also boutique market stalls with fresh local produce available. Located inside Vetro Mediterranean Foods you will find Revolver Espresso. Locally owned and operated by the wonderful Andy and his team, Revolver Espresso is hub of delicious coffee and great cabinet food, try one of their almond croissants. You will not be disappointed! Andy also won Barista of the year at the 2017 Rotorua Hospitality Awards, so you know you’re in good hands! These guys also roast their own coffee beans which they supply to independent coffee outlets around town including our own coffee cart here at OGO Rotorua! We were also fortunate enough to have Andy train our staff in the art of making coffee. 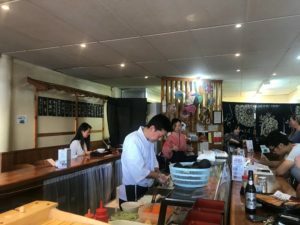 There you have it our top picks for where to eat and drink in Rotorua, whether you fancy a sit-down meal or a takeaway option we guarantee there is something for all tastes and you won’t leave hungry! If you won’t take our word for out check out @rotoruaeats on Instagram!